A 70-year old woman was seen by the hematologist on the basis of the following blood count: Hemoglobin: 8,8 g/dL; Thrombocyte-count: 13x10E9/L and a leukocytosis of 55x10E9/L. 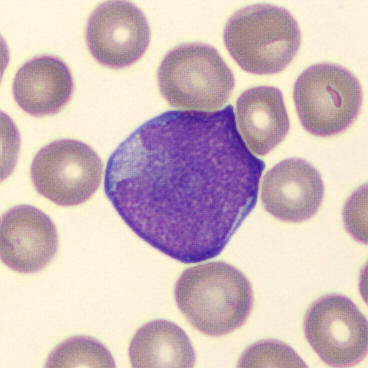 The following aberrant cells were seen in the peripheral blood smear. What is your diagnosis? Please post your suggestions. This blog is created by CellaVision for laboratory professionals with a particular interest in hematology and digital cell morphology. Our aim is to inform, educate and inspire in equal measures – by highlighting interesting articles, sharing interesting patient cases and cell images, and presenting inspiring success stories from our community of CellaVision-users from around the world. It is highly likely to be an Acute case of a Myeloid Leukaemia. 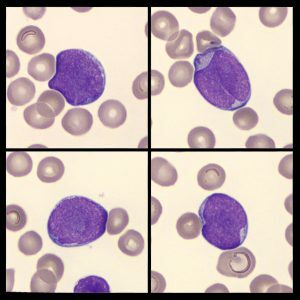 The blast cell picture posted here may have crowded out other cell line in the BM resulting in severe thrombocytopenia of PLT= 13x10E9, ⤵️RBC and as a consequence anaemia with HGB of 8.8g/dl. These are all blasts. Could be an acute leucemia. Do you have an interesting story to share? We invite you to put forward reflections on our blogposts and to share challenging patient cases and interesting cell images that you come across in your work. Copyright © 2015 Cellavision. All rights reserved.